Usually the end of March, early April. Hosted at the Golf Club of Houston (Humble). Spend a few hours serving and the rest of the time enjoying the event. Houston Alumnae Chapter of Sigma Kappa Sorority established an endowment fund to honor our alumna sister, Elizabeth Landymore Smith. Elizabeth Smith was an honor initiate of Epsilon Omicron Chapter at National Convention in 1976, and she affiliated with the Houston Alumnae Chapter that same year. Since that time, Elizabeth has served her sorority, both nationally and locally, with meritorious dedication and loyalty. 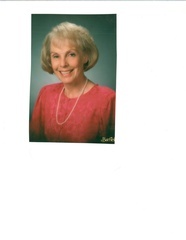 Elizabeth Smith founded the Houston Sigma Kappa Foundation in 1981 and served as its president for twenty-five years. Upon Houston Alumnae Chapter's recommendation, Sigma Kappa Sorority presented Elizabeth Smith with the Pearl Court Award in 1994 in recognition of her leadership and service to our beloved sorority. Elizabeth is a past Board Trustee of Sigma Kappa Foundation, and Sigma Kappa Sorority honored her with the Colby Award at National Convention in 1986. In 2011, the Houston Sigma Kappa Foundation turned over the funds to the national Sigma Kappa Foundation, establishing the Elizabeth Landymore Smith Endowment. Our hope is to add to this endowment to create a fund where the interest will generate scholarships for years to come. Dr. Smith has an extensive teaching and research background in health care and business. She specializes in knowledge management, quality of health care, communities of competence, and critical thinking. She has considerable experience in creating, presenting, and evaluating a wide range of educational programs for numerous health care professionals. Her academic degrees are general psychology and human factors. Dr. Smith has served on the business and psychology faculties of the University of Houston Clear Lake, Rice University, Houston Baptist University, University of Texas-Houston Health Science Center, Division of Continuing Education, Strategic Air Command's Air Force Institute of Technology, Minuteman School, and University of Wyoming. Courses taught included human and organizational behavior, organizational theory, organizational development, organizational psychology, training and development, managerial principles, general psychology, clinical psychology, and tests and measurement. Dr. Smith supervised graduate student research and graduate student internships in health care, public service, and government institutions. She also presented numerous three-day seminars on motivation and productivity for the energy industry in the U.S. and abroad. She was evaluator for National Cancer Institute grants awarded to the University of Texas MD Anderson Cancer Center, Houston. From 1971-1976, a total of 200 physicians, nurses, physical therapists and occupational therapists attended one of the 20 two-week intensive cancer education programs. She developed and directed a two-week "Teaching How to Teach" program for 25 directors of family practice residency programs located in 18 states. Dr. Smith was project director for a Regional Medical Program of Texas grant to write two texts in cancer education for health care professionals. These books were subsequently published by McGraw-Hill. She was project director for a Region VII grant from the Office of Education, Department of Health, Education, and Welfare to investigate motivation and group structure. She has obtained and participated in Sigma Xi distance education grants in science. Dr. Smith has written six books. The Productivity Manual (1990 and 1995 2nd ed.) was translated and published in Spanish in Argentina and Portuguese in Brazil and Portugal. Creating Productive Organizations (manual and facilitator's guide) was published in 1995. She is sole author of over 45 peer reviewed articles and experiential learning exercises for business, psychology, and health care. She was contributing editor for University of Texas-Houston publications and The Quality Observer. She is currently contributing editor for the International Journal of Business Performance Management and the International Journal of Productivity & Quality Research. In 2005 she received a trademark from the U.S. Patent Office for her concept of Communities of Competence, a framework and method to enhance professional competence through collaboration and communication. From 1982 to present Dr. Smith serves as Vice President of Summit Resources, Inc., an energy-based corporation. Major responsibilities included property sales, negotiations, and acquisitions, local and state regulatory, compliance, and tax matters, and joint interest operations in Texas, Louisiana, Montana, North Dakota, and Wyoming. Dr. Smith obtained 501(c)(3) status for Houston Sigma Kappa Foundation in 1981 and has served as its only president, was secretary and executive director of two other health care organizations. Other major offices are: 1984-2010 Sigma Xi, the Scientific Research Society, secretary and board of directors, International Society for Productivity and Quality Research, board member and international membership committee, and member of the American Society for Quality, American College of Healthcare Executives, and others. National recognition: "Who's Who of American Women", "Outstanding Young Women in America," "Woman of Excellence Federation of Houston Professional Women. Resolutions from Jon Lindsay, County Judge, Harris County from Federation of Houston Professional Women, Proclamation from Houston Mayor Bill White' office, May 4, 2005 for Elizabeth A. Smith Day, and Proclamation from Stanford Who's Who, October 9, 2010. The endowment's purpose is to provide scholarships for initiated undergraduate members of Sigma Kappa who are in good standing, have a minimum GPA of 3.00 on a 4.00 scale, exemplify the ideals and standards of Sigma Kappa, exhibit outstanding sisterhood and have demonstrated leadership within the fraternal community. At least one scholarship award must be given to an initiated undergraduate member of a Sigma Kappa Chapter located in Texas.